The Polit Bureau is deeply concerned at the un-seemly haste with which the government of India has been going ahead with the merger/amalgamation process of three nationalized banks viz., Vijaya Bank, Bank of Baroda and Dena Bank ignoring the collective opposition of the employees and officers together of the entire industry. The merger of banks is being justified by the Government on ground of strengthening and consolidating the concerned banks; but in reality, such a merger will further weaken all the three banks post merger. Problems of public sector banks emanate from the deliberate default in loan-repayment by the big corporate houses. The solution lies in stern action by the Government for outright recovery of the huge loan amounts from these defaulter corporates with penalty instead of the futile exercise on merger. However, the Government has been displaying a totally indulgent attitude to the defaulter corporates and through the Insolvency and Bankruptcy Code (IBC) procedure public sector banks are being forced to accept big reduction of the defaulted loan amount. Such merger of banks, instead of addressing their basic problems, will actually result in squeezing the banks’ operational areas through inevitable closure of several branches seriously affecting employment. It also affects the spread and availability of banking services for common people particularly in comparatively remote areas. The CPI(M) opposes the harmful exercise of merger of banks and calls upon the government to desist from such moves. ‘Merger’ has become the most important word in the banking sector. It is only a few weeks back that the 5 associated banks and the Mahila Bank were merged with SBI, despite strong protests from the employees and their unions. Now it is the turn of other PSU Banks. 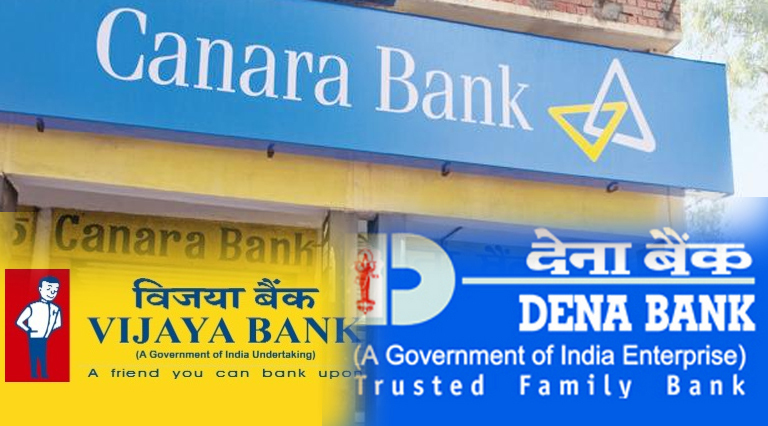 Vijaya Bank and Dena Bank is being merged with Canara Bank. The government says that mergers are necessary for creating big banks. Whether such merger will benefit the customers and workers? After the merger of the Associated Banks and Mahila Bank with SBI, the government is proposing to merge the Nationalised Banks. Two or three PSU Banks are planned to be merged in to one. The Finance Ministry is reported to be in serious discussion in the matter. According to the Ministry, the 21 PSU Banks have to be reduced through merger. In this connection, the reported statement of Dy. Governor of SBI that the Nationalised Banks should be de-nationalised, hints to the diabolic thinking of the government – Merge the PSUs and privatise! 5. State Bank of Bikaner and Jaipur. The decision of the Cabinet is to be strongly opposed since it is against the interest of the customers, the banks and the employees. This is part of the neo-liberal policy of India and intended to help the private banks. This will result in closure of many branches of the affiliated banks and retrenchment of many employees through VRS or CRS. Our full support to the struggle of the bank employees against this anti-worker anti-PSU decision. The employees of the State Bank of Travancore (SBT) are on agitation against the decision of the Government to merge it with SBI. The government has decided to merge all its affiliated 5 banks with SBI as also the Mahila Bank. This decision is against the best interests of the bank, bank employees and the customers. Instead of discussing with the workers and settling the issues, the bank authorities have issued order prohibiting demonstrations, rallies, meetings and agitational activities near the bank premises. There is no doubt that these restrictions are engineered by the NDA government at the centre. The working class have to fully understand the present crisis and prepare for might struggles. The 2nd September 2016 Strike called by the central trade unions against such attacks and on major demands of the working class has to be made a great success. Though the NDA government is taking undue delay in taking decisions on the recommendations of the VII CPC, on the justified demands of the working class and also stopping the high price hike, it is moving fast with destroying the Public Sector Units. The latest is the cabinet decision to merge the 5 associated banks with the SBI, which is strongly opposed by the bank employees and the trade unions. In the name of strengthening the SBI, it is destroying the associated banks which have served the people in a big way. The merger will neither serve the interests of the SBI. Many branches will be closed and employees will be reduced. The organisations of the Bank employees are on struggle against the fully unjustified decision of the government. Our full support and solidarity to them. We demand the government to retract from the wrong step. The Finance Minster Arun Jaitely has stated that he is expecting early govt. decision on the merger of the Associated Banks with the State bank of India.The Associate banks are State Bank of Bikaner and Jaipur, State Bank of Travancore, State Bank of Patiala, State Bank of Mysore and State Bank of Hyderabad. Mahila Bank also will be merged. SBI first merged State Bank of Saurashtra with itself in 2008. Two years later, State Bank of Indore was merged. SBI has maintained since then that it would merge others as well but none of its moves fructified due to lack of capital (which was pegged at least Rs 2,000 crore each for per bank) and stiff opposition from employee unions. The Bank Employees have strongly protested the merger move since it will neither improve the services nor improve the finance of the SBI. Shri Ashwani Lohani, CMD Air India is reported to have said that Air India started posting loss and troubles started after the merger of the two PSUs Air India and Indian Airlines. We said the same thing at that time itself. So, what we said has been confirmed by no less a person than the CMD Air India himself. Our objection to the merger of BSNL and MTNL is relevant in this context. Before any merger takes place between BSNL and MTNL, the issues we have focussed should be settled. The government has now decided to merge the SBI Associate banks with SBI. This is nothing but destroying both SBI and its associate banks. Naturally the bank workers are opposing the same tooth and nail and one day strike has already taken place. The Bank workers of the Associated Banks of SBI ie. State Bank of Travancore, State Bank of Mysore, State Bank of Hyderabad, State Bank of Bikaner and Jaipur, State Bank of Patiala and Bharatiya Mahila Bank are on Strike today, 20th May 2016, against the decision of the government to merge these banks with the SBI. The merger will reduce the number of branches of these banks, reduce the number of staff and will result in loss of business. The merger is being done for the benefit of the private banks as part of the neo-liberal policy. Support the bankmen strike against unjustified merger of associated banks with SBI! There are indications that the Central Government may approve merger of 50% DA with pay for the Central government employees. The VII CPC may consider this issue urgently. The V CPC has granted 50% Merger of DA, while the VI CPC maintained silence. The Confederation of Central Govt. Employees and Workers has gone on strike on 12-13 February with demands including merger of DA with pay. At present the DA for CGE is 90%. It is expected that another 10% will become due w.e.f. January 2014. In that case, the DA will reach 100%. The government should consider merger of 100% DA itself.